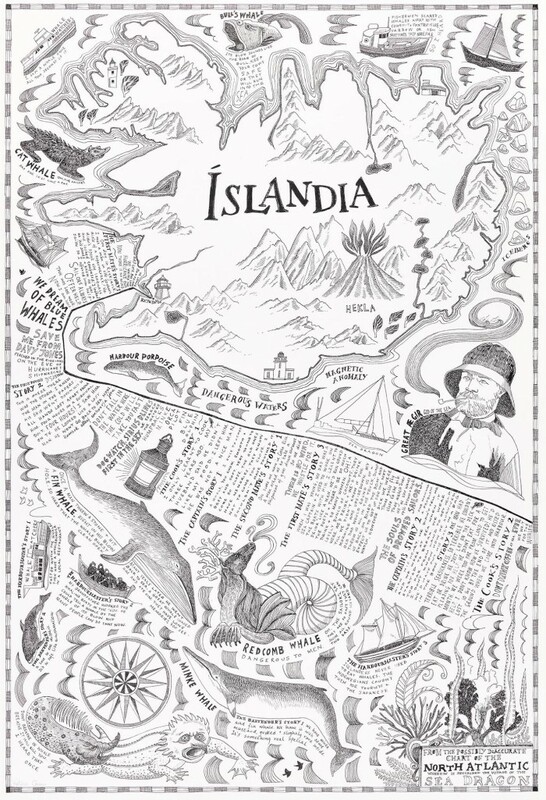 ‘Islandia’ is the first part of the triptych, ‘We Dream of Blue Whales’, a map created as the result of a residency sailing across the North Atlantic. In the summer of 2014, I and three other artists joined the crew of Sea Dragon, a 22 metre steel sailing boat that journeyed 1300 miles across the Atlantic Ocean from Reykjavik in Iceland to Gothenberg in Sweden. Working with marine biologists, scientists, documentary film makers and an old Icelandic sea captain, we spent time on board, not only helping to work the boat but also searching the waters for whales and dolphins. Journeys are made of stories and every traveller describes the places he has been using stories. This journey is mapped from the yoghurt aisle of a supermarket in Reykjavik, crossing 1300 miles of the North Atlantic swimming with stories of sea monsters, mermaids, pirates, ghost ships, smugglers and rum and ending in a cocktail bar built into the jaws of an ancient preserved blue whale in Gothenberg. Part maritime chart, part logbook, the work became an illustrated artist’s map with a story. ‘The Whale Road’, a joint exhibition with Katie Henery, Stuart Kuhn and Jonathan Hyde was the final destination point for the map. Held at Onca Gallery in March 2015, installation, photography, film, drawing and mapping told a sea saga of elusive whales, hunters and saltwater. A Map of the Winter Skies in the Northern Hemisphere. A hand drawn and lettered map in watercolour, gouache and ink of Soho and Covent Garden for a private client. Part I of the chart mapping a sea journey 1300 miles from Iceland to Sweden in travellers' tales and stories of whales. Part II of the chart mapping a sea journey 1300 miles from Iceland to Sweden in travellers' tales and stories of whales. Part III of the chart mapping a sea journey 1300 miles from Iceland to Sweden in travellers' tales and stories of whales. An annotated map of the moon documenting layers of lunar knowledge from the earliest drawings in caves to the moon landings. Echolocation – The Flightpath of Starbeard 3. A map of the flightpath of a Barbastelle bat through the Sussex Weald in ink on mountboard.